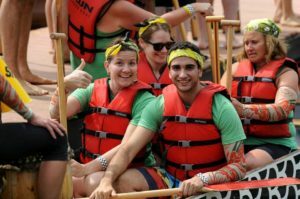 There’s a required minimum of 8 (eight) women paddling in each Dragon Boat in each heat. The minimum age for paddlers is 14 years old. Each team will include 20 paddlers, 1 drummer and 1 steer person (provided). Dragon Boats, life jackets and paddles are provided by Great White North. Race goes on regardless of rain, postponed during lightening and thunderstorms. Team captains must attend a mandatory meeting Sunday at 8:45am in Green’s Park. Team waivers will be signed on Saturday at registration. Teams can set up a 10×10 tent in Green’s Park and bring food and beverages. Don’t forget the sunscreen!